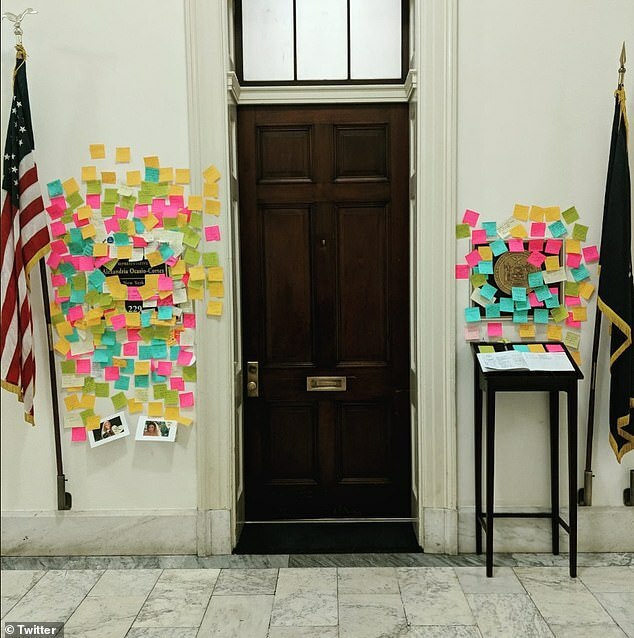 Enough people have threatened to kill democratic socialist Alexandria Ocasio-Cortez that her staff has been trained to evaluate visitors to her Capitol Hill office — even people who just leave Post-It notes on the plaque in the hallway. The stunning reality of being America's new liberal 'it' girl, a media darling who incenses conservatives, is laid bare in a Time profile that landed the New York congressional freshman on the magazine's cover. The Democratic congresswoman from the Bronx, 'Wonder Woman of the left and wicked witch of the right' in the lengthy interview, complained that her millennial generation has grown up in an America that falls short of its promise. 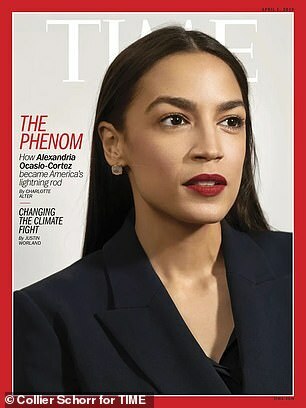 Time explores her influences, including the father who moved his family from a working-class New York City neighborhood to a tonier Westchester address to improve his children's schooling options. By the time the future politician finished her first year at Boston University, he had lung cancer. A decade later, Ocasio-Cortez is teetering on the edge of a political phenomenon that's out of proportion with her power to change a nation as America remains resistant to the leftism that catapulted her to stardom. 'America isn’t her district,' former Barack Obama adviser Joel Benenson told Time. He argued that Democrats shouldn't run so hard toward socialism that they forget to placate the moderates who comprise most of the party. 'Democrats shouldn’t take the bait,' he said. It's unclear how much sticking power the Latina political darling has: Polling data from Gallup show that her public approval rating nosedived since she burst onto the political scene. Significantly more Americans recognize the Democratic congresswoman's name since a combination of socialism and shoe leather catapulted her to stardom with a Democratic primary win over a 10-term incumbent. Just 21 per cent of American adults told Gallup's pollsters last month that they didn't know who Ocasio-Cortez was. That number was 50 per cent in September, before she coasted to victory in the general election. 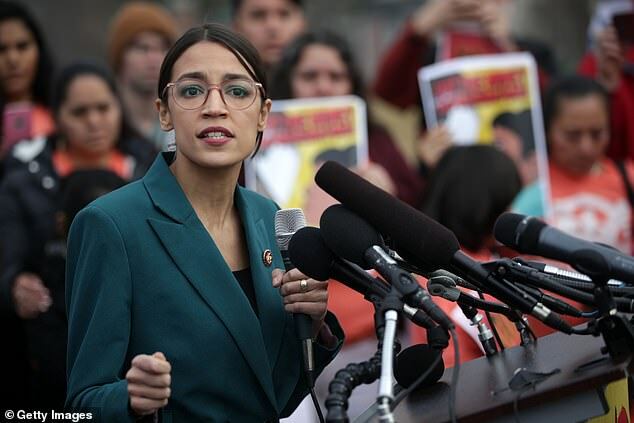 Ocasio-Cortez won a favorable rating from 24 per cent of Americans In Gallup's September poll, compared with 26 per cent who disagreed. Those numbers both grew by February, to 31 per cent favorable and 41 per cent unfavorable. That means the proportion her detractors have grown by 15 per cent while her backers grew just 7 per cent. 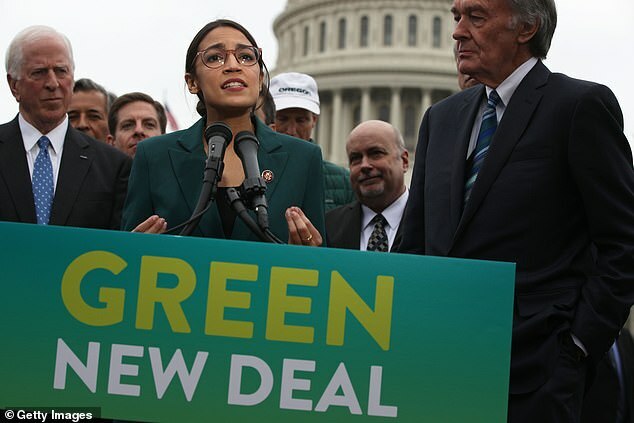 The democratic socialist wunderkind has more admirers than opponents among nonwhites, women, Americans age 18-35 and self-identified Democrats. Every other demographic is against her. 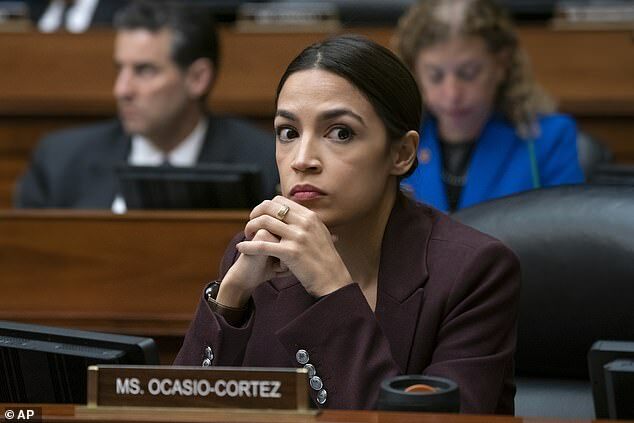 It remains to be seen whether Ocasio-Cortez's carriage will turn into a pumpkin by the time she stands for re-election next year. Time notes that she 'boosted the grassroots effort to block Amazon’s plan to establish a new hub in New York,' costing the city 25,000 jobs. That's a move that New Yorkers blame her for, more than any other player in the high-stakes drama. Amazon itself wore the goat horns just 26 per cent of the time. Ocasio-Cortez celebrated the Amazon pullout, objecting to $2.8 billion in tax breaks the online retail giant was to receive.